When author Lee Israel falls out of step with current tastes, she turns her art form to deception. Based on a true story, 2018’s Can You Ever Forgive Me? places Melissa McCarthy in a more dramatic role than usual. Once a best-selling biographer, Lee Israel (McCarthy) finds it hard to locate an audience for her newer work and she falls on hard times. Desperate for cash, Lee sells a hand-written letter sent to her by Katharine Hepburn. When she sees the ease with which this transaction proceeds, Lee decides to forge missives from other celebrities and use these to rescue herself from dire financial straits. As noted earlier, McCarthy veers from her usual brand of broad comedy to take on a more straight part via Lee. Don’t expect a completely radical departure from McCarthy’s established cinematic persona, though, as Lee can feel like a more restrained take on the typical McCarthy performance. This makes Lee a good choice for McCarthy, as the role allows her to stretch her talents without a move toward a radical departure. A character wholly unlike prior McCarthy parts might feel forced, but Lee comes close enough to the actor’s standard wheelhouse to offer a logical progression. McCarthy handles the role well, as she manages the mix of drama and comedy with aplomb. Of course, it comes as no surprise that she musters the movie’s acerbic laughs, but she also handles the character’s dramatic arc in a natural, smooth way. Of particular note, McCarthy never begs the audience to embrace her. While Lee goes from mostly unlikable to vaguely sort of endearing by the story’s end, McCarthy doesn’t attempt to ingratiate herself to the viewer at any point. She allows for Lee to become more human without excessive sentiment or mawkishness, no small feat in a story like this. And make no mistake: Forgive offers a fairly standard narrative arc. We follow Lee’s problems, her momentary financial salvation, her downfall and her steps toward eventual redemption, just like in hundreds of prior movies. This fairly predictable progression doesn’t become a flaw, but Forgive also never manages to elevate the tropes. It executes the story in a brisk, engaging manner, though, as it ensures that we stay involved from start to finish. In addition to McCarthy, a strong performance from Richard E. Grant as Lee’s seedy friend Jack adds to the movie’s success. Given how dour and misanthropic Lee tends to be, Jack’s giddy narcissist acts as a good balance, one that brings levity to the tale. Grant handles the role well and brings light liveliness to the film. We buy him as a street hustler but not one who seems stuck in the usual clichés, mainly because Grant’s charm carries the day. A mix of real-life morality fable and lesson about the importance of human relationships, Forgive succeeds most of the time. It never elevates its genre, but it provides an engaging 106 minutes. Can You Ever Forgive Me? appears in an aspect ratio of approximately 2.40:1 on this single-sided, double-layered DVD; the image has been enhanced for 16X9 sets. Even within the parameters of SD-DVD, this seemed like a pretty mediocre presentation. Sharpness was adequate at best. Closeups showed decent delineation, whereas wider shots appeared fairly soft and tentative. Jagged edges and shimmering were only a minor problem, and I saw no print flaws. Occasional edge haloes interfered with the image, though. Colors seemed low-key, with an emphasis on teal and amber. These choices felt less than exciting, but the DVD represented them in a passable manner. Blacks provided reasonable depth, while shadows appeared fairly smooth. Ultimately, the image felt decent but no better than that, as it seemed somewhat mushy. As for the film’s Dolby Digital 5.1 soundtrack of Forgive, it failed to make much of an impression. The soundfield gave us mild ambience at most, without much use of the various channels. This meant it focused on the front speakers and didn’t bring us much in terms of scope. That said, the soundscape seemed perfectly adequate for a character drama of this sort. Music appeared good, as the score and songs came across with nice range. Nothing exceptional occurred, but the mix felt appropriate for the movie. The disc includes an array of extras, and we open with an audio commentary from director Marielle Heller and actor Melissa McCarthy. Both sit together for this running, screen-specific look at story/characters, cast and performances, editing and music, sets and locations, and general thoughts. For the most part, this becomes a likable chat. At times, it feels a bit light on cinematic insights, and it’d have been nice to learn more about the movie’s fiction vs. the real-life facts. Still, McCarthy adds some humor and we learn just enough to make the track worth a listen. Five Deleted Scenes fill a total of nine minutes, 49 seconds. One offers a simple outtake, but others offer a bit more of Lee’s day to day life. I can’t claim any of these feel important, but they’re entertaining, especially when we see an awful job Lee tried to endure. We can watch these with or without commentary from Heller. She gives us notes about the sequences and why she cut them. Four Promotional Featurettes appear. We find “Elevator Pitch” (1:39), “Becoming Lee Israel” (1:42), “Likely Friends” (1:43) and “A Literary World” (2:11). Across these, we hear from Heller, McCarthy, producer Anne Carey, costume designer Arjun Bhasin, production designer Stephen Carter and actor Richard E. Grant. They give us basics about story, characters, performances and design in these forgettable snippets. Two Galleries show up as well: “Unit Photography” (31 frames) and “Lee Israel Letters” (14). “Unit” is fairly forgettable, but the “Letters” are fun to see – or they would be if the DVD resolution didn’t make some of them tough to read. The disc opens with ads for The Favourite, The Old Man and The Gun and The Sisters Brothers. Sneak Peeks adds clips for Three Billboards Outside Ebbing, Missouri and The Shape Of Water. We also find the trailer for Forgive. 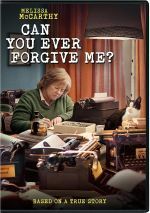 Buoyed by a strong lead performance from Melissa McCarthy, Can You Ever Forgive Me? manages to succeed. Despite a mix of genre clichés, the movie stays involving and bright. The DVD brings bland visuals as well as adequate audio and some useful supplements. I like Forgive but wish Fox had produced a Blu-ray version, as this DVD’s iffy picture quality doesn’t serve the movie well.